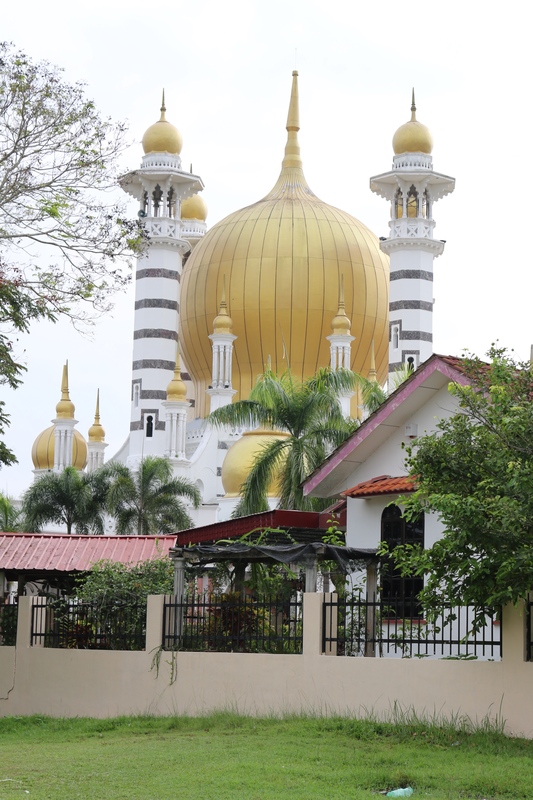 Ubudiah Mosque in Kuala Kangsar is widely recognised as one of the most beautiful mosques in Malaysia. 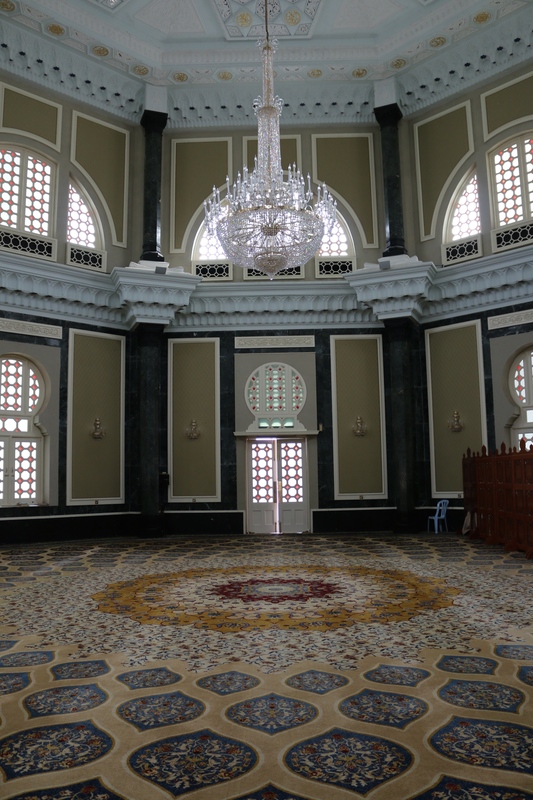 While in Kuala Kangsar recently I took the opportunity to peek inside Ubudiah Mosque since it was early in the morning and no prayers were going on. 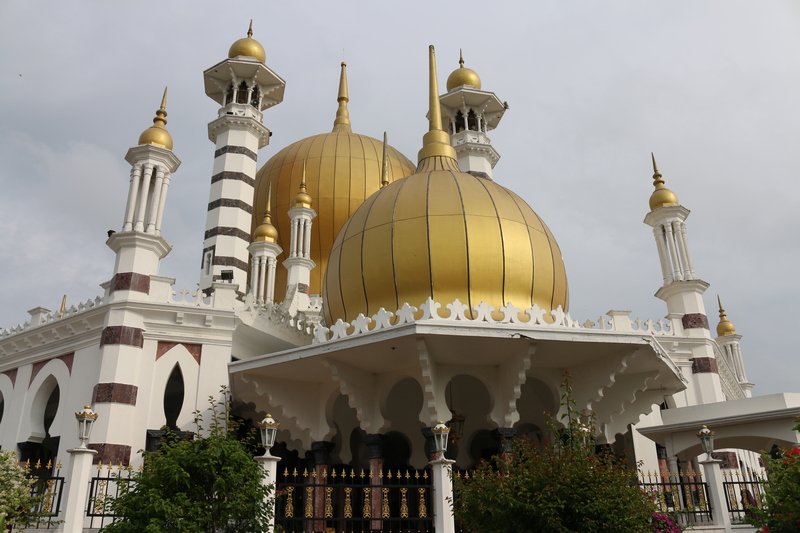 This mosque is thought by many to be the most beautiful in Malaysia, even though it was designed by a British non-Muslim. The government architect was Arthur Benison Hubback who was also responsible for KL railway station, Ipoh railway station and many other famous Malaysian landmarks. The architectural style is said to be Mogul-Gothic, drawing on elements found in Mogul mosques around India. It was built during 1913-1917. The mosque features a bulbous onion dome and four main 126 feet high minarets each topped by an Indian style ‘chatri’. The main prayer hall is octagonal and surprisingly small, about 20 yards across. 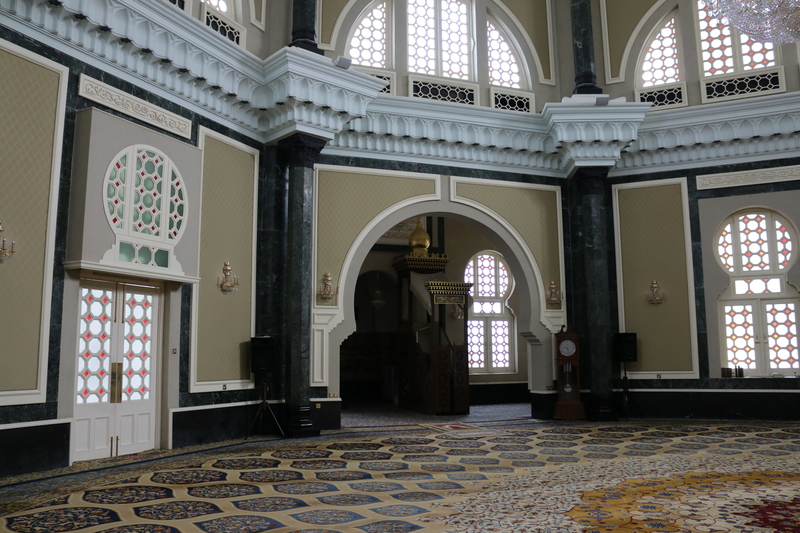 In common with all mosques, there is no furniture inside other than a carved wooden screen, segregating the women’s section, and the minbar (pulpit). The space is air-conditioned. The recessed mihrab (the niche designating kiblah, or direction of prayer) is lined with naturally patterned Italian red marble. This Persian carpet covering the interior is probably not the original from Hubback’s time. 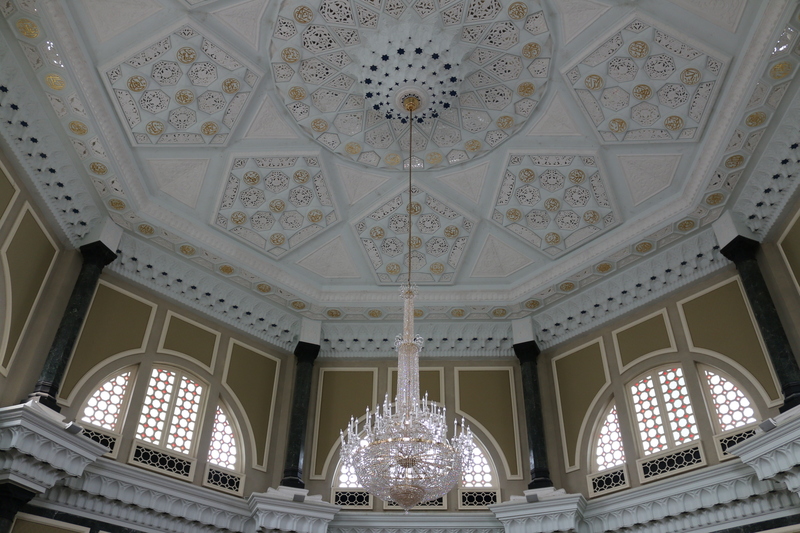 There is a fine wall-to-wall Persian carpet and a chandelier hanging from the intricately decorated ceiling. Intricately decorated ceiling of Ubudiah Mosque. 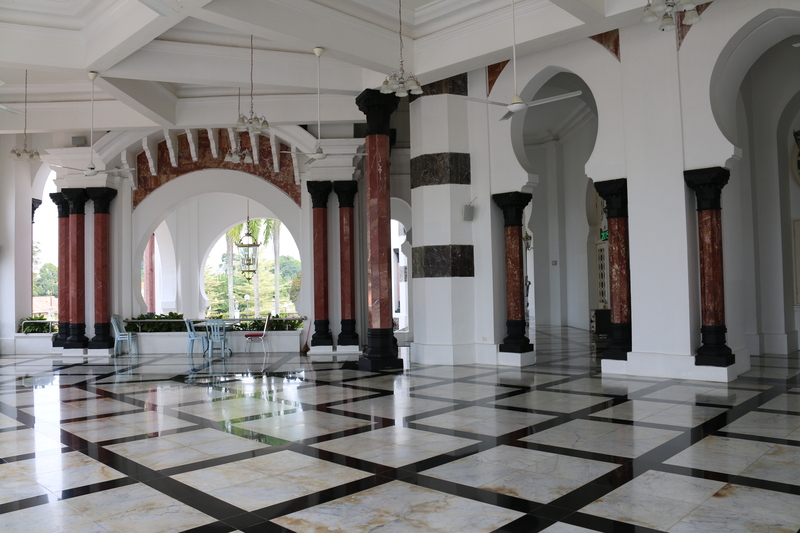 The mosque’s guardians found that it was too small for modern day purposes so new verandahs were added in 1993 to accommodate additional worshippers. Ubudiah Mosque was extended in 1993 by adding verandahs. These have matching red, black and white marble floors to complement the original design. Next door to Ubudiah Mosque is the Royal Mausoleum where Perak’s Sultans and family members going back to the 1800’s are buried. It is built in similar style to the mosque. Non-Muslims are welcome to visit the mosque provided they are appropriately attired and visit outside of prayer times.